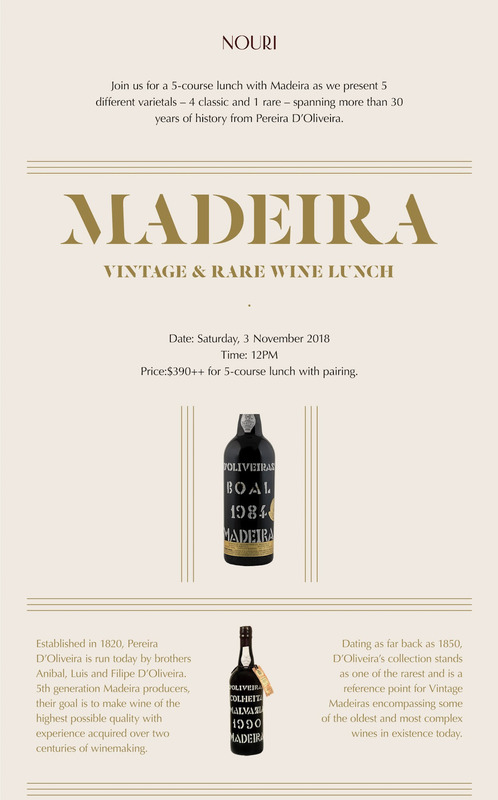 Restaurant Nouri will be hosting a wine lunch on Saturday 3 November 2018 at 12pm featuring the Madeira wines of Pereira D’Oliveira. Pereira d’Oliveira is a producer of Madeira wine, the fortified wine made on the Portuguese island of Madeira off the coast of Africa. The independent winery is currently run by the descendants of the founding owners, three brothers who represent the fifth generation of knowledge and experience dedicated to the production, commercialisation and export of their wines. This will be a five course lunch with wine pairing, with 4 classic and 1 rare varietal. This lunch costs $390++ per person. To book, call 6221 4148 or info@nouri.com.sg. You can also make your reservation online here.